How to Convert iTunes M4V Videos to MOV Format ? MOV is a file format created by Apple Inc. and natively used by QuickTime Player. Now, videos of MOV formats can be also played on other media players like Windows Media Player, VLC and others. MOV, as a container format, can contain audio, video, effects, or text (e.g. for subtitles). 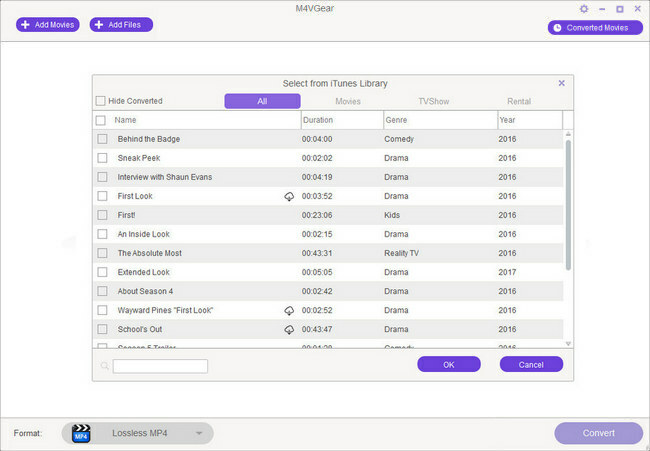 The advantage of MOV files is the ability to contain abstract data references for the media data, and the separation of the media data from the media offsets and the track edit lists. That means that they can be easily edited - no need to rewrite all media data after editing. M4V is also a file format created by Apple Inc., but can be exclusively played with iTunes on computer, iPad, iPhone and iPod because M4V files from iTunes are generally DRM protected. Apple inserts Fairplay into M4V videos downloaded from iTunes to prevent them from copying, spreading, and editing. Preserve all multilingual subtitles of original iTunes M4V videos. Support many other output formats like MP4, AVI, MP3 and so on. 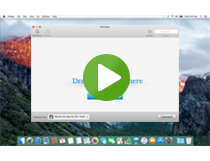 Let us see in the below how to remove DRM from iTunes M4V videos and convert them to MOV format with M4VGear. Step 1: Download and install M4VGear for Mac or for Windows according to your operating system. Step 2: Press "Add Movies" button on the upper left or "Add Files" button in the middle and choose the iTunes M4V videos you want to convert to MOV format. 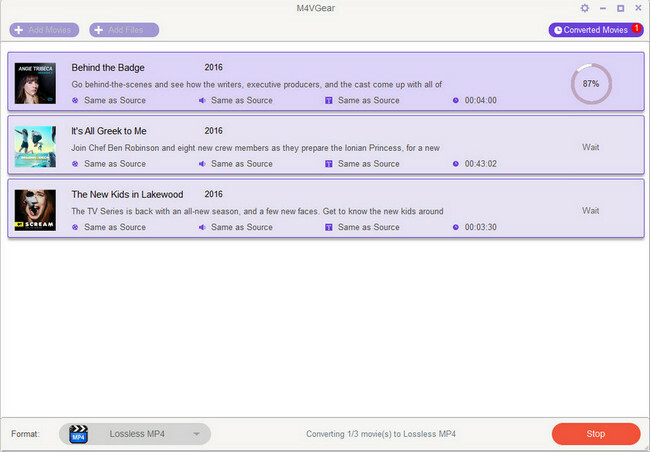 Click "OK" and then the selected videos will appear on the panel of M4VGear. Step 3: Choose "Lossless MOV" as output format in the column of Recent Used. In this case, 5.1 audio track and all subtitles will be kept by default. Step 4: Start to convert iTunes M4V videos to MOV format by clicking "Convert" button on the bottom right. During the process, do not control iTunes in case that some errors happen. Step 5: When conversion is finished, the output folder will be opened automatically and you can find the MOV files there. Or click "Converted Movies" button to find the converted MOV files.